Trek the amazing Larapinta Trail through the high ridgelines of the West MacDonnell Ranges, the Ormiston and Serpentine Gorges and hike Mount Sonder at sunrise. Be amazed by the dramatic colour changes in the rock formations at Glen Helen Gorge and Standley Chasm. This is one of the most spectacular outback experiences in Australia. These Larapinta trail walks take us through land sacred to the Arrernte Aboriginal people since the Dreamtime. Here we gain a deeper understanding of the ancient Indigenous cultures and Traditional Owners of the land. This walk is suitable for both experienced hikers seeking a spectacular challenge and for those who just want to experience the beauty of the Larapinta Trail on foot. With two guides, we can offer an easier walk each day for those that want it. This is a way of experiencing the splendid isolation and remoteness of the most spectacular parts of the Larapinta Trail with quality dining and in relaxed, comfortable accommodation. Short, steep hill sections. Moderate active lifestyle and some walking experience recommended. 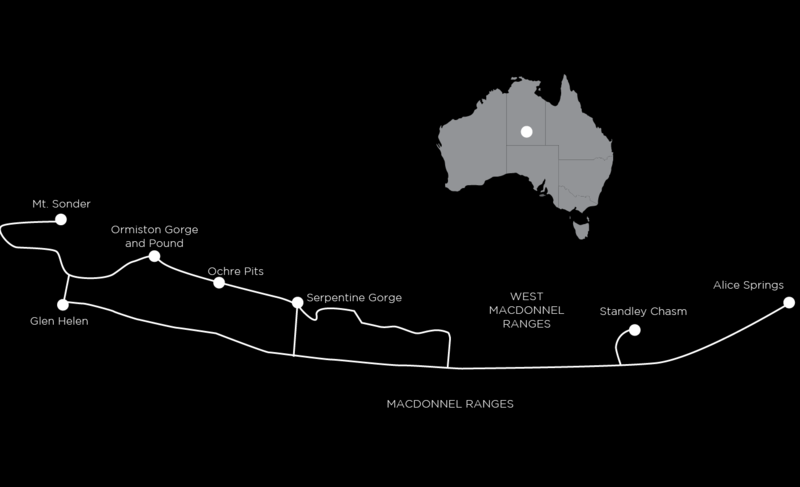 After meeting in Alice Springs, we will drive west along Larapinta Drive and then Namatjira Drive through the West MacDonnell National Park towards Ormiston Gorge, our first stop on the Larapinta Trail. We will stop at Ellery Creek Big hole for a short leg stretch and trip briefing. The Ormiston Pound circuit walk is on a moderate track and takes around 4 hrs. Leaving Ormiston gorge, the walk heads into low hills surrounding Ormiston Pound, stopping first at a serene lookout and then heading down into the pound itself and meeting the ancient Ormiston Creek River. We then follow the Ormiston Creek into an incredible lunch spot in the Ormiston Gorge, surrounded by towering red rock cliffs. Following lunch, we rock hop down the gorge and gradually climb up to the iconic Ghost Gum Lookout overtop the main waterhole before descending back to our starting spot. From here, there will be time to laze by the Ormiston Gorge waterhole with ice cream or coffee and have a refreshing swim. Today we visit Counts Point which is one of the iconic and unbeatable viewpoints in Central Australia and of the Larapinta Trail. The first few kilometres of this walk are quite easy and level until we reach the base of the Heavitree Range. We then climb up to the crest of the ridge at Eagles Landing and are rewarded by uninterrupted views stretching to the horizon on all sides. Towards the end of the ridge, we reach Counts Point and stop for a well-earned lunch break with outstanding views. After leaving the lookout, we then descend off the ridge via a spectacular spur. We drop into the lovely shaded Lomandra Gully for a rest on our descent. The last few kilometres of the walk are along an easy, flat bush track. We commence the walk near the old Serpentine Chalet. Turning west, we walk for two kilometres in the low foothills to the start of the Inarlunga Pass. We then rock hop up into the pass where we have lunch, surrounded by Cycads and fascinating red quartzite cliffs. Following lunch, we may head out into the Hidden Valley beyond Inarlunga depending on time and inclination. Retracing our steps down the gorge, we then continue west and walk to the nearby Ochre Pits and learn about the cultural significance of this place to the Aranda people. For today’s walk we will start at the nearby Ormiston Gorge following the low foothills and plains overlooking the Davenport and Finke rivers. Stop along the way at a spectacular lookout and rest while we enjoy the amazing views on all sides. We then drop down to meet the Finke River where we rest in the shade of magnificent River Red gums for lunch. After lunch, we follow the riverbed down for another 1.5 km to where we reach the Two Mile Campground where there is a lovely swimming hole. A place to relax for a while before heading home. Today we will leave very early to avoid the heat and take advantage of the sunrise and the best light of the day. After 500m of easy walking, we reach the start of the climb onto the ridge leading up to Mt Sonder. This will be the steepest part of the climb today. Taking short, regular breaks, we will reach the main ridge and head along it to the 3km mark lookout where we will see the magnificent dawn spreading across the landscape below. From here, the next few kilometres are a gradual climb until we reach a short, sharp descent where we will stop for snacks and then start climbing again towards the summit. The final stretch of the climb is much easier. Here we have brunch and a cuppa to celebrate. As we return, we enjoy the views below us on the descent. Once back near the trailhead we will have a picnic lunch in the river bed and take a well-earned rest in the shade. At Serpentine Gorge, we commence our easy, flat, one-hour return walk into the beautiful Serpentine Gorge, where we rest in the shade and peacefully enjoy the reflections on the ancient rock whilst spotting birds coming to drink at the waterhole. The next stage of the walk is a short climb up to the lookout peering down into the ancient and spectacular upper reaches of the gorge. This is also a great chance to search for Black-Footed Rock wallabies which call the cliffs of the gorge home. Returning the same way, we hop in the bus and head to Standley Chasm nestled in the Chewings Range. Standley Chasm, known as Angkerle Atwatye to the Aranda people is located in a private nature reserve owned by the Iwupataka Land Trust and is operated by Aboriginal family members of the local Traditional Owners. This Larapinta Trail tour ends with a relaxed breakfast at the hotel. The tracks are well graded except for small sections where the walks are uneven and rocky. However, all the tracks are still easy to negotiate. Full day walks average about 14km. There are great opportunities for walkers to challenge themselves on most of the walking days. We stay five nights at Glen Helen Lodge the only accommodation located within the Tjoritja – West MacDonnell Ranges National Park, 130km west of Alice Springs. This extraordinary landscape is 800 million years old and has been home to the Western Aranda Aboriginal people for tens of thousands of years. We get to enjoy the comfort provided by the lodge with Glen Helen Gorge and the national park right at your doorstep. Importantly the lodge is owned and now also run by the traditional owners with some assistance, which means by staying here we are supporting the local people. At the end of each day, all the benefits of having a private room await, including a hot shower and a comfortable bed. The lodge, partly an old homestead, reflects the region’s character and is in an amazing location, offering up great views including sunsets like no other over the West MacDonnell Ranges. Importantly all the rooms have their own ensuite. The Mercure in Alice Springs is a very good quality hotel in an excellent location. It’s a big property with plenty of room to relax either by the pool, in the garden or in the many other facilities that it offers. All of the a la carte two course dinners are prepared by the in-house chefs at Glen Helen and the Mercure. There’s an emphasis on Australian game meat, Top End fish, tropical fruit and bushtucker. The packed lunches and picnics complete the circle ensuring that your appetite is always satisfied. In fact, you can look forward to having lunch on a daily basis at some of the most incredible locations on the Larapinta Trail. A walkers lunch may include a high protein type salad, a roll or a wrap, a muesli bar, cake or muffin of some kind, plus a piece of fruit. Each day is slightly different. Lunch is always augmented by Auswalk’s famous trail mix. Importantly, you start each day with a cooked breakfast, expertly prepared by the in-house chefs. This is a great way to ready yourself for the upcoming walk. The Larapinta Trail tracks are dry and firm but often rocky under foot. Most of the walks are easy to moderate. The easier walks are great for first timers. However, the walk often involves challenging walking of between 4 to 9 hours each day, across rocky terrain and ridgelines with steep inclines, so the experienced hikers won’t be disappointed. Please be advised that it may be warm this time of year and that you will need to carry at least 2 litres of water with you each day. This trip operates with two experienced and knowledgeable guides so we can offer easier and harder walk options along the way. Pre and post tour accommodation: There are many good hotels in Alice Springs, however we pick up and drop off at one central hotel the Mercure (formerly the Chifley), Alice Springs. The tour starts at the Mercure at 8.30am and includes the final night at the Mercure on return. This environment is only suitable to walk from May to August as it is too hot at other times. Nights are generally significantly cooler than day time temperatures. Please ensure you bring warm clothing for the evenings. The climate is marked by very low humidity. Please ensure you have at least 2L capacity for water on the walk, as this will be necessary. See the Bureau of Meteorology information about average temperatures and rainfall at different times of the year. We strongly recommend purchasing a travel insurance policy as we charge a cancellation fee if you cancel your Auswalk holiday after we have confirmed it. We offer a 30% discount on travel insurance booked via our website. Get an instant quote and purchase online now. If you have any questions, feel free to ask one of our destination consultants or to speak with one of our guides. You can get in touch with us via our contact form, email us at info@auswalk.com.au, or call us on +61 3 9597 9767.